Home » Useful Guide » How to put and play Movie/Music on Motorola Droid X? How to put and play Movie/Music on Motorola Droid X? Tip: You may just like to know the way to transfer or copy movies/musics from PC to Motorola Droid X. The easy way to Put and Enjoy Movie, Music on Motorola Droid X. Today I could focus on the way to convert and play movies/musics on Motorola Droid X. Now we have known that Motorola Droid X can play video in MP4, MPEG 4, H.264, H.263, music in MP3, AAC, AAC+, eAAC+, WMA, WAV, etc. So if we had lots of videos in other format, what we need is just a powerful Motorola Droid X Vdieo Converter, which can convert all movies/musics like Divx, XviD, AVI, TiVo, FLV, M4V, MOV, VOB, MTS, M2TS, MKV, WMV, MPEG, F4V, SWF, AC3, DTS, FLAC, OGG, etc to MP4, MPEG4, H.264, H.264, WMV, MP3, AAC, etc for playing on Motorola Droid X. Step 1: Download Aunsoft Best Video Converter for Droid X, install and run it. Step 2: Please click "Add" to import kinds of movies/musics you want to put on Motorola Droid X to this program. Step 4: Start the conversion from movie to Motorola Droid X. Tip: If you like converting and playing movies on Motorola Droid X on a Mac, you can try the Mac Droid X Movie converter. If you want to put and play DVD, Blu-Ray movies on your Motorola Droid X, you could select Aunsoft Blu-Ray Ripper. For Mac users, please choose similar products for Mac. After conversion, you can put the music; put the movies on your Motorola Droid X for enjoying now. But you may wonder that how to transfer the musics or movies to Motorola Droid X, don't worry, please keep on reading. 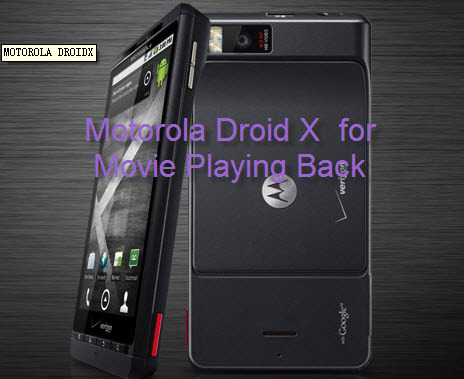 The Way to Transfer or Copy Movie/Music to Motorola Droid X. 2. Once mounted, on the computer, open the drive that represents your device. It should be in My Computer/Computer for Windows users. 4. Copy the converted videos into the Movie or Music folder. 5. After copying movies or musics, eject the drive. Now the converted movies can now be played on your Motorola Droid X using the Gallery application. Thanks for your reading, and hope you could enjoy the program and well putting and playing movie/music on Motorola Droid X.
Aunsoft Droid X Column, Convert AVI files to Motorola Droid X, Make Full Screen Videos on Droid X, Mount and Play Videos to Droid X in Car, Convert EVO to Motorola Droid X, Convert MKV files to Motorola Droid X, Convert WMV/WMV HD to Droid X, Convert Blu-ray to Motorola Droid X, Convert VOB Files to Motorola Droid X, Convert M2TS to Motorola Droid X, Convert TiVo to Motorola Droid X, Convert MTS to Motorola Droid X,Transfer DVD to Droid X for Playback, Rip DVD ISO Image to Droid X MP4, Play DVD IFO in Motorola Droid X, Stream Droid X Videos to HDTV via DLNA, Play Droid X Gallery Video on TV via HDMI, Put Movie and Music on Motorola XOOM.